Hidden in the AWS (Amazon Web Services) documentation is all sorts of useful information about various services. 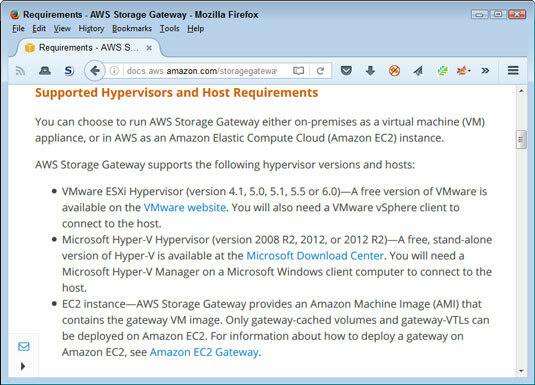 For example, AWS Storage Gateway will connect an on-premises software appliance (an application combined with just enough operating system capability to run on hardware or on a virtual machine) with cloud-based storage. In other words, you use the gateway to connect your application to the data storage it requires. It might seem as if running the gateway in the cloud would be a good idea because you wouldn’t need to invest in additional hardware. However, when you look at the requirements shown, you see that using an EC2 instance allows you to run only gateway-cached volumes and gateway-VTLs (you can’t run gateway-stored volumes). You don’t need to know what these terms mean, but you do need to understand that the cloud present limits that you must consider during any planning stage. Using cloud-based services can come with limitations. Even though basic hardware needs become less expensive, you do need to consider additional expenses in the form of redundancies. Most organizations find that the hardware costs of moving to the cloud are substantially less than maintaining a full IT department, which is why they make the move. However, you must make the move with the understanding that you have other matters to consider when you do.